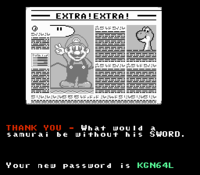 The Sword is an item in the NES release of Mario's Time Machine. It is a katana that belonged to Minamoto no Yoritomo during his reign. At some point in 1192, it is stolen by a time-traveling Bowser and placed inside of his museum alongside other stolen items, where it is then kept guard by Koopa Troopas. It is later taken by Mario, who then travels back in time to Japan to return it. While there, he meets Minamoto no Yoritomo, who threateningly tells him to leave his weapon at a shrine under some lanterns. Once he does so, a news article appears, questioning the nature of a samurai that does not have a sword. This page was last edited on March 11, 2019, at 15:34.